A map is not the territory it represents, but if correct it has a similar structure to the territory, which accounts for it usefulness. We are map makers constructing representations or depictions of our experiences. The mental maps we create of the world are not true or reality – they are based on reality. As human beings we do not respond directly to the outside world but we do to our mental maps, representations or depictions. We make our maps and models by using our sensory representations–pictures, sounds, feelings, smells and tastes. The models that we create to guide us in the world are based on our conditioning and experience. Each of our models, or maps, of the world are unique. We experience our own personal reality, and then we respond to and deal with that reality accordingly. A representation is not what it represents; one is a symbol for the other. This distinction may been insignificant on the surface. However, as we explore the process by which maps, models, and representations are built, it will become clear that the relations ship which exists between map and territory, when examine din detail, has an effect on the very structure of reality as we may know it. No two people have exactly the same experiences. So our representations of the world determine which experiences and responses we will have. Some aspects of our maps may are out of our conscious awareness. Still, they determine how we will perceive the world and what choices we will have available-or not-as we interact with and within that world. This is key. This what is available out of learning and being able to do NLP – having the ability to change your experience in any area of your life. If you are aware of your map of reality, you can change it and have exactly what you want. To change our experience we must change our maps! When interacting with others it is very important to remember that we operate from within our own maps of reality. Our personal maps form “bubbles of belief” around us. These bubbles filter our experience. They organize the meaning of our experience in relation to what we already know. Our bubbles of beliefs separate us from and connect us to the reality of others (Connect if our beliefs are similar, separate us if our beliefs are different.). Frequently, when we look out from inside our personal bubbles, we only see our own reflections. A model is a symbolic representation that depicts structure of our reality. Each of us builds models or representations of the world. And, it is through these models that we organize and communicate our personal experiences. The process of modeling allows us the ability to have an infinite variety of experiences. And if we are using a model for our personal realities then those realities can be interpreted, understood, and utilized. Modeling is way we transform the chaotic into the structured and make sense of our worlds. A model is neither good nor bad, right nor wrong, but can be evaluated only as to its usefulness in making available specific outcomes. Models inherently provide both limitations and resources. The magic lies in the very structure and syntax of our words, pictures, sounds, sensations, smells, etc. Because our maps govern all our experiences, if we change the map, our experience changes. This means our personality, awareness, emotion and abilities to do a new skill come from our maps. These maps also drive our ability to influence, persuade and transform. Fritz Perls, Virginia Satir and Milton Erickson did not work on the everyday life experiences of people. Instead they worked on changing these people’s internal models of the world. As a NLP practitioner this is the charge. This is why it is so difficult to quantify what can be accomplished through NLP because the change is so deeply personal. Our maps occur inside our mind-body systems. So to create influence, persuasion and transformation in others we must be able to change the receiver’s neuro-linguistic maps. It is Korzybski that we can thank for his observations of our internalized maps realty. He analyzed how our nervous system interacts with our worlds at various different levels. He figured out our sense receptors are designed to leave out many characteristics and generalize about the information missing. He even showed how different levels of the brain made different kinds of mental maps about things. But Gregory Bateson in 1972 asked if we create internalized maps, what gets mapped on these maps? He later answered the difference. So that our mental world is just maps of maps of maps for infinity… the map is not the territory because the territory never gets in to our minds because the process of representation will always filter out the territory. The thing about presuppositions is that they are not necessarily true. They are observations that Richard Bandler and John Grinder observed as the beliefs that were held by Virginia Sitir, Milton Erickson and Fritz Perls when they were achieving excellence in change with their clients. We can use these when dealing with others and create great changes in ours and others experience by holding even one of these. However in NLP, if you want to have the best results, you want to hold all of them. I have many, so stay tuned and I will try to explain them all in detail and give some examples. NLP is… An operator’s manual for being human. As with any significant technology there are several versions. NLP was the result of many people’s individual work and personal views combined together. The original founders of NLP were Richard Bandler and John Grinder. They organized the original information and built in their new insights. They started with the psychology work of Sigmond Freud and Pavlov’s Stimulus Response. Richard and John then added to it the work of Fritz Perls (gestalt, perception, responsibility, choice, paradox, behavior, needs, values, congruence), Virgina Satir (Family systems, representational systems, matching, predicates, feedback) and Milton Erickson(reaching the unconscious, metaphor, marking out the words, humor, puns, riddles, paradox). 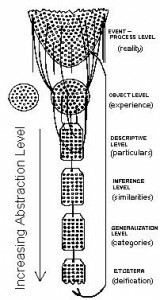 In the realm of Linguistics they took the work of Alfred Korsybski (Maps of Reality, we code our reality thus creating our reality, our coding has slip-page) and Noam Chomsky (Surface structure, deep structure, Impoverished and inadequate maps result from malfunctions in perceptions and thinking, presuppositions of thinking disclosed in language). They also used from computers and mathematics: chunking, ways of thinking and levels of abstraction. They looked and added in pieces that fit from Zen and other eastern religion philosophies, the work of Robert Assagioli, systems analysis, theory, cybernetics and others. The original contributor and developer list includes: Judith DeLozier, Leslie Cameron-Bandler, Robert Dilts, David Gordon, Lynne Conwell, Michael LeBeau, Norma and Phil Barreta, Robert Hill, Genie Laborde, Jonathan Rice, Frank Pucelik, and Mary Myers. It is no wonder that when you learn NLP that it is as different as the original developer that taught that person. And, it is that different. Some NLP was designed by some people who didn’t want to have feelings. There is some NLP that emphasizes language. There is NLP that was developed by people that thought people needed cookie cutter approaches for changing things. This is very procedural. In fact most of the NLP out there is of this language only, cookie-cutter variety.